Prepare the Manischewitz® Extra Moist Yellow Cake according to directions. Add the mashed bananas, chocolate chips and walnuts to the batter and mix well. Pour batter into muffin tins, filling them up to the top. Bake for 25-35 minutes in a 350 degree F oven. Set aside to cool for frosting. Frosting: Scoop out the Frosting onto a plate. Add the peanut butter, and with a fork, combine well. 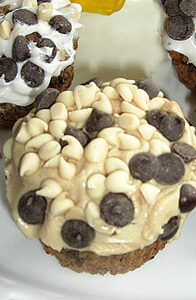 Spread over cooled banana muffins and decorate with chocolate chips. Serve and enjoy!